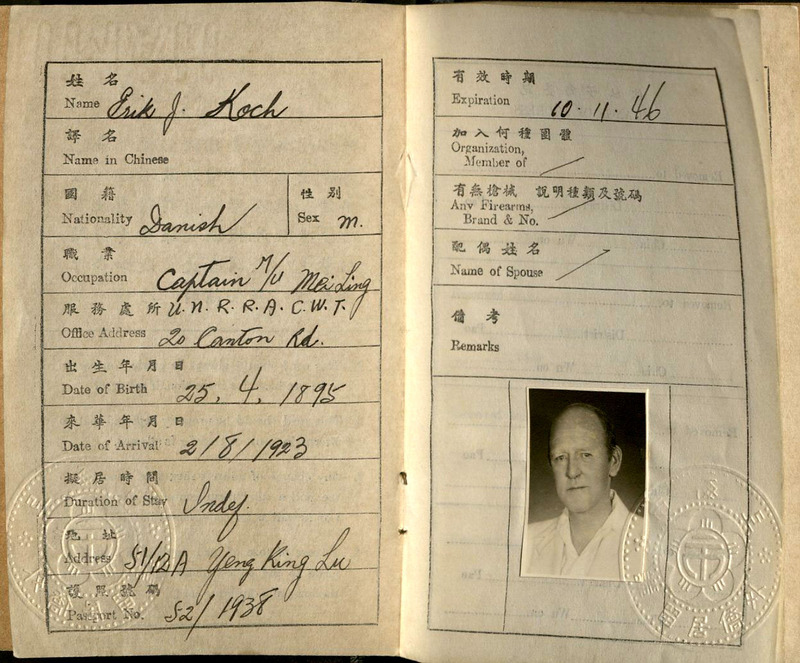 The Old China Hands Archives in Special Collections and Archives holds materials from a variety of individuals that lived and worked in China during the early 20th century, including two small collections of materials from Scandinavian ship captains who worked with international shipping companies delivering goods along the China coast. 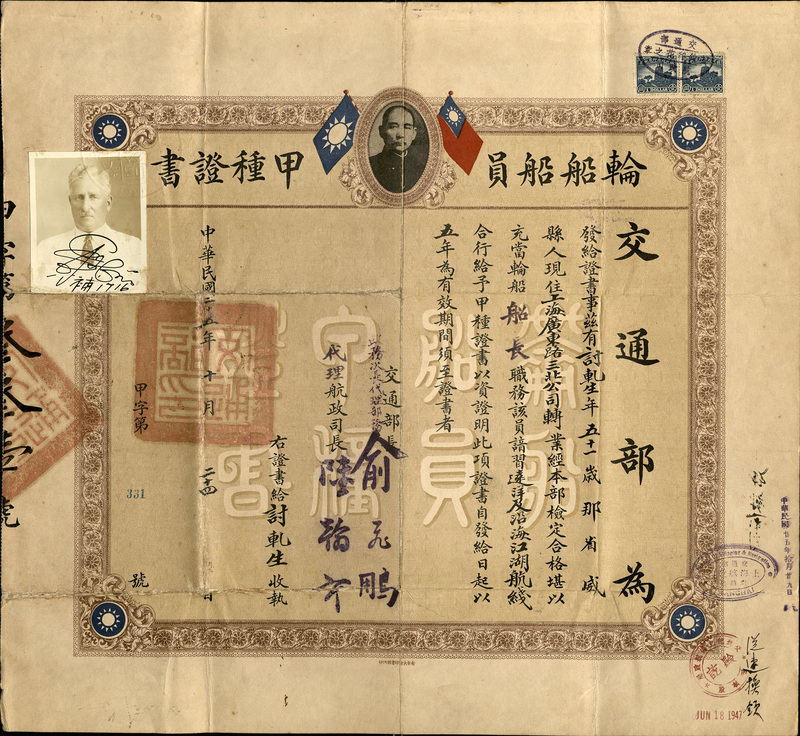 The Erik J. Koch Collection contains the materials of a Danish sea captain who came to China in 1923, while the Olaf Torgersen Collection includes the records of the Norwegian-born Torgersen, who arrived in China in 1914. 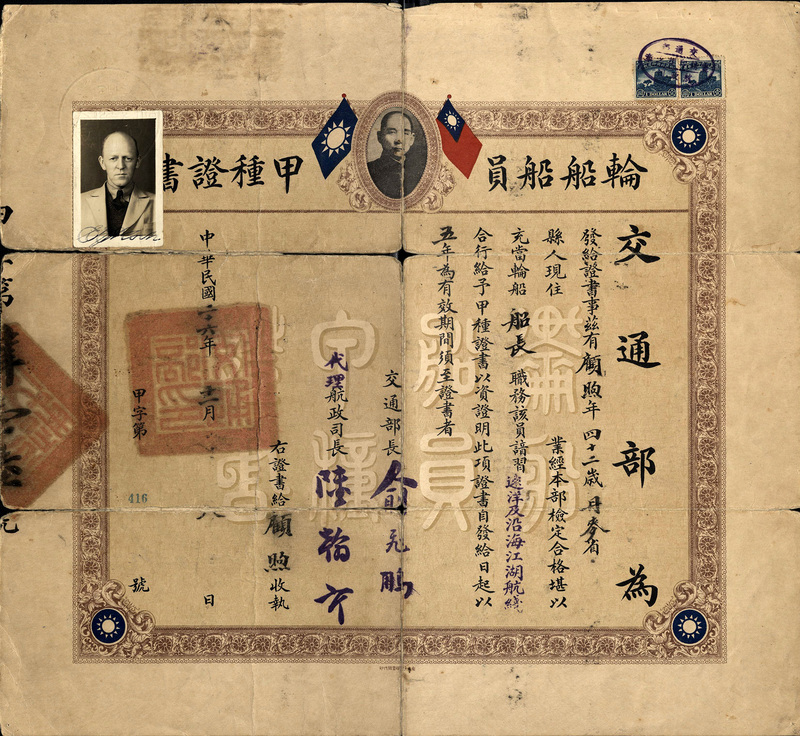 While the two men had completely separate lives and careers, the similarities between the two collections offer some interesting insights into both the foreign shipping industry in China, and major historical events they experienced. 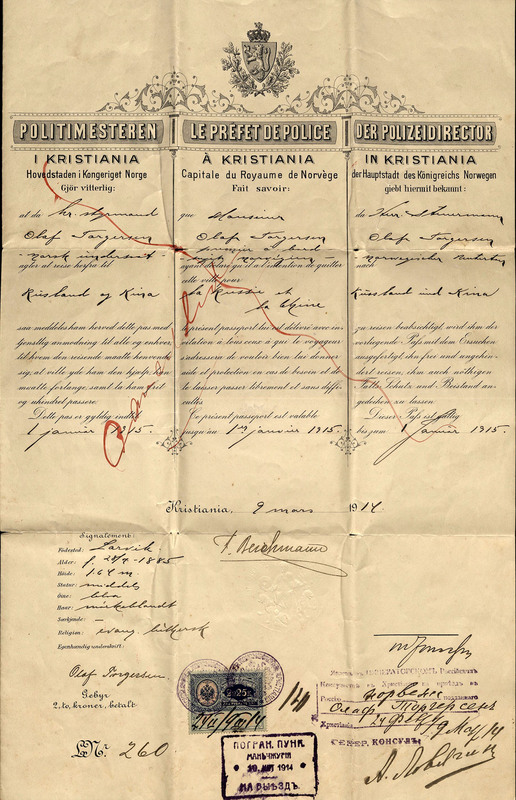 One interesting aspect of both collections is the number of master's certificates held by Torgersen and Koch. 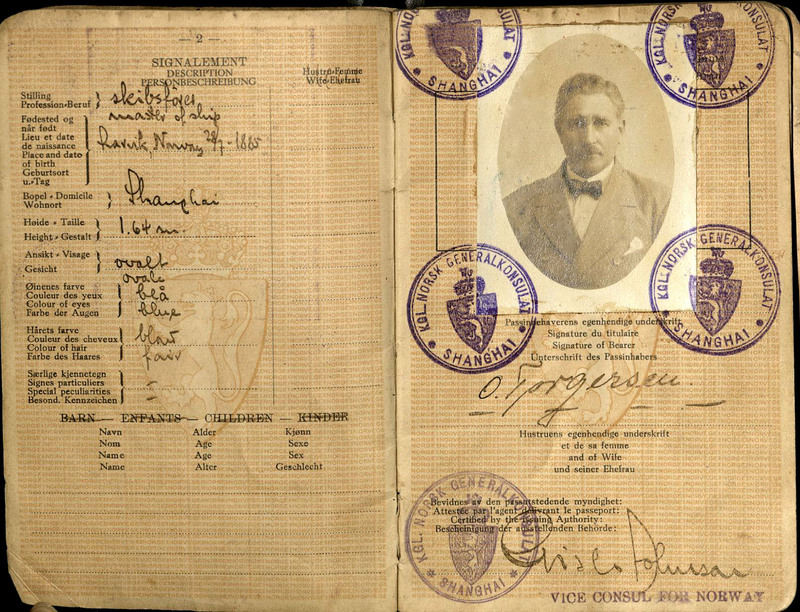 A master's certificate, or license, is required to captain a vessel. They could be limited to different sized ships or even geographical scope in some instances. 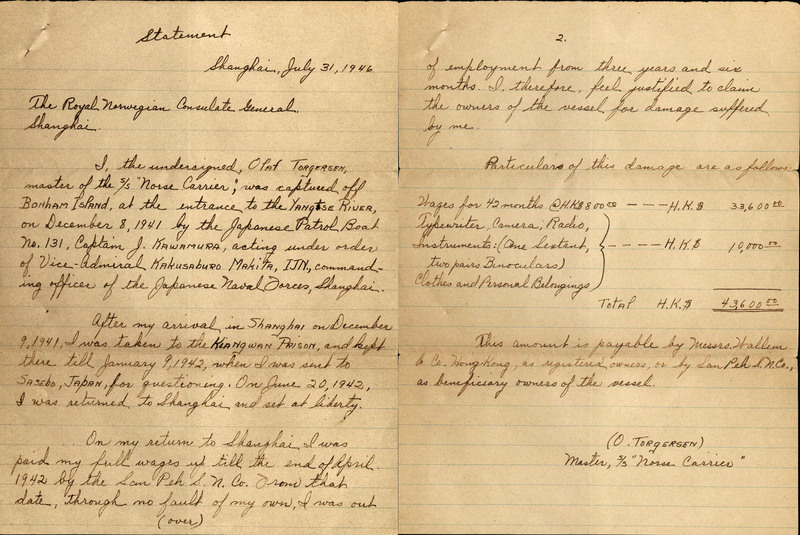 Both Torgersen and Koch held unrestricted tonnage certificates, meaning they could captain a ship of any size. 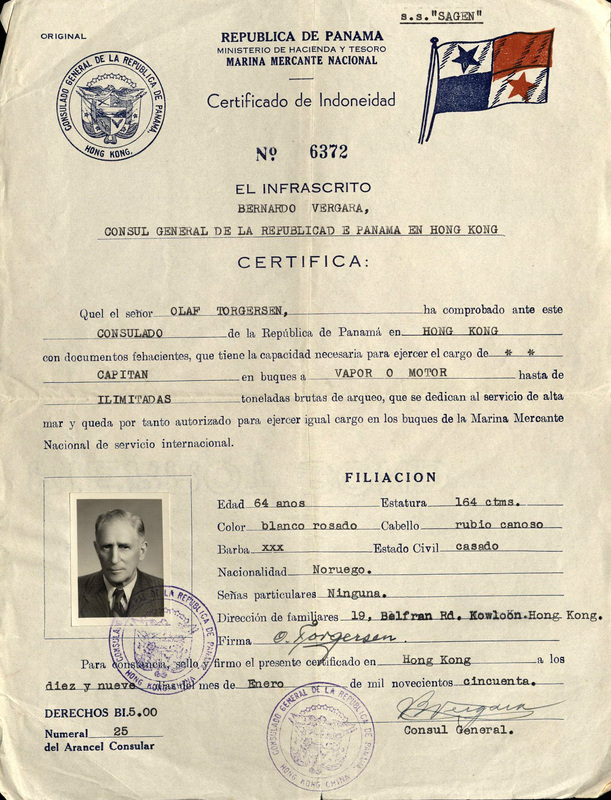 They also held multiple certificates from various countries, most notably Panama, because sea captains are required to have a master's certificate from their ship's flag state, or the state under whose laws the vessel is registered or licensed, rather than the state they are from or in which they work. 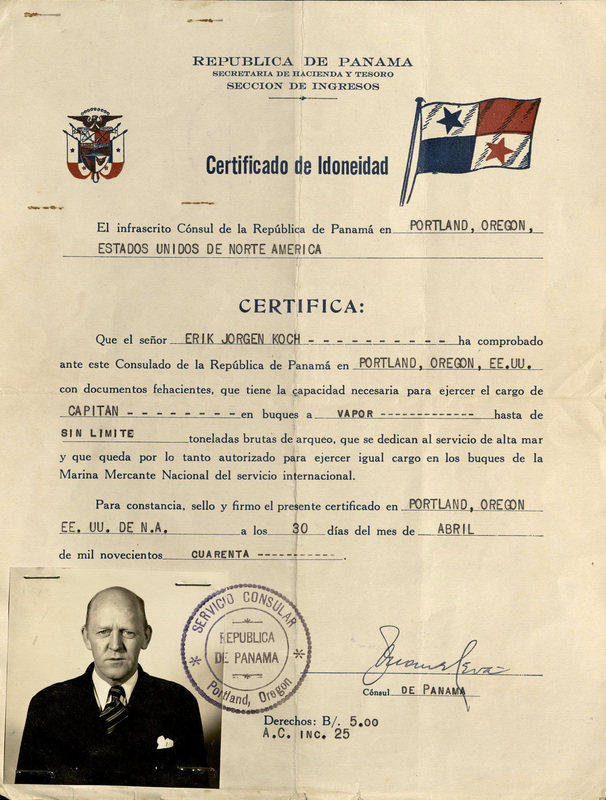 While neitherTorgersen nor Koch lived or worked in Panama, their Panamanian certificates reflect the emerging practice in the 1920s of companies from countries like the United States registering ships under a "flag of convenience," or a country that registers foreign ships and generally has looser regulations and cheaper labor costs. 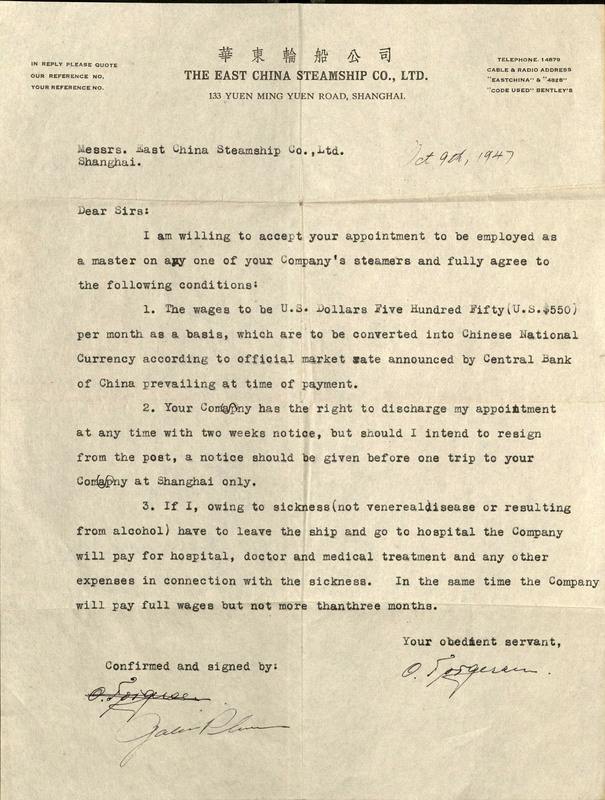 This is a widespread tactic still used in the international shipping industry, and while the practice was only beginning during their careers, the fact that both of these men sought to gain Panamanian certificates is a strong indicator of how widespread the practice already was within the shipping industry in China during the 1940s. 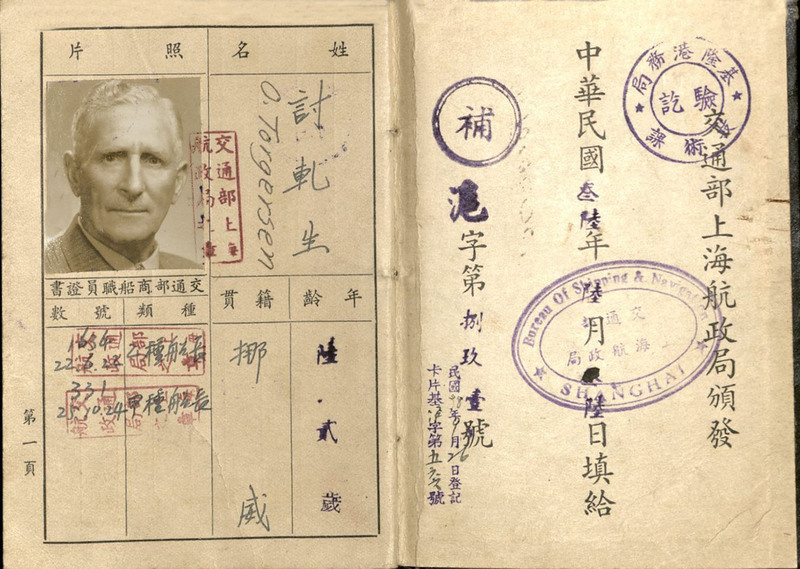 Another insight that can be gleaned from these documents is the impact of World War II on the shipping industry in China. December 8th, 1941 (or December 7th, depending on the side of the international dateline one happened to be on), was a monumental day in the progression of the Second World War, as the Japanese military not only attacked U.S. forces at Pearl Harbor but also invaded many areas in Asia and the South Pacific, including staging an occupation of the British and American-controlled International Settlements and seizing ships along the China coast. 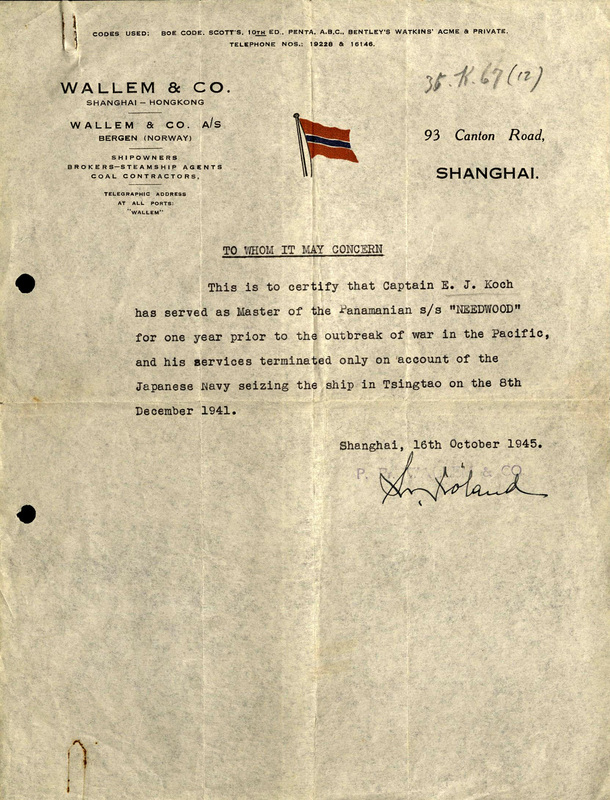 Documents from the collections show that both Koch and Torgersen had their respective ships seized by Japanese forces on December 8th, and Torgersen states in a 1946 letter seeking reparations that he was actually held prisoner for over 6 months, in both Shanghai and Sasebo, Japan. 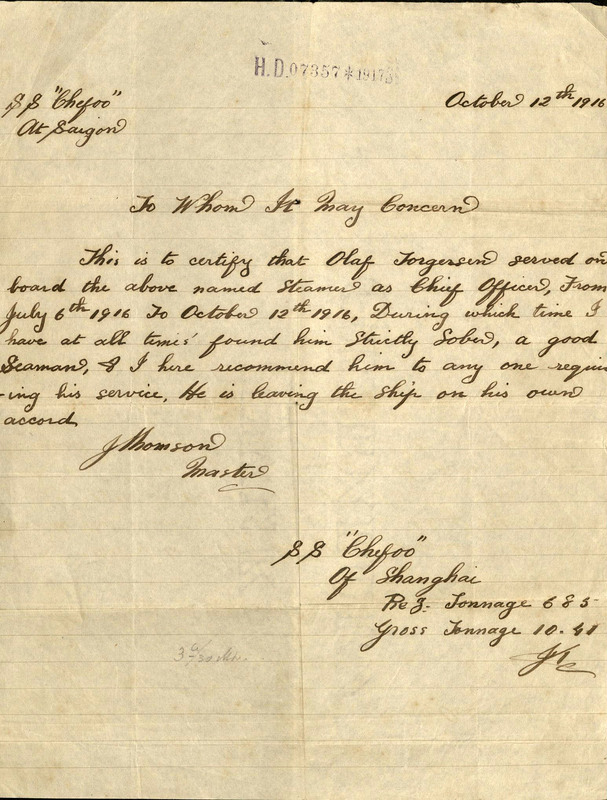 The documents show that both men lost their jobs due to the seizure of ships, and while the greater impact on Koch is unknown, Torgersen claimed he was unable to find work for three and a half years, when the war was over.